BURT J. THOMPSON ATTORNEY AT LAW STATE BANK BUILDING FOREST CITY, IOWA October 25, 1965 Mr. Howard Bowen, Pres. 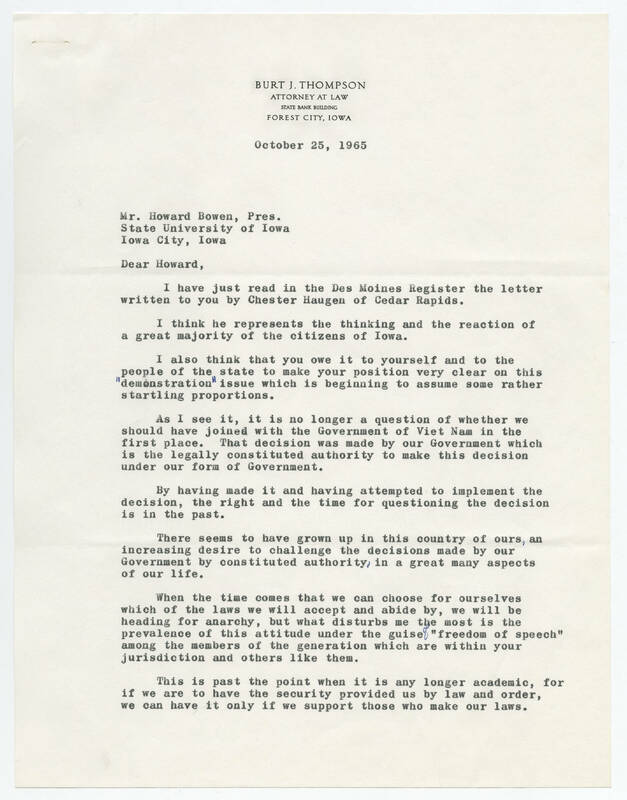 State University of Iowa Iowa City, Iowa Dear Howard, I have just read in the Des Moines Register the letter written to you by Chester Haugen of Cedar Rapids. I think he represents the thinking and the reaction of a great majority of the citizens of Iowa. I also think that you owe it to yourself and to the people of the state to make your position very clear on this "demonstration" issue which is beginning to assume some rather startling proportions. As I see it, it is no longer a question of whether we should have joined with the Government of Viet Nam in the first place. That decision was made by our Government which is the legally constituted authority to make this decision under our form of Government. By having made it and having attempted to implement the decision, the right and the time for questioning the decision is in the past. There seems to have grown up in this country of ours, an increasing desire to challenge the decisions made by our Government by constituted authority, in a great many aspects of our life. When the time comes that we can choose for ourselves which of the laws we will accept and abide by, we will be heading for anarchy, but what disturbs me the most is the prevalence of this attitude under the guise of "freedom of speech" among the members of the generation which are within your jurisdiction and others like them. This is past the point when it is any longer academic, for if we are to have the security provided us by law and order, we can have it only if we support those who make our laws.